The sleek, white and blue drift boat buzzes down a crystal clear river that is filled with hard fighting fish that were eager to attack a surface fly. Large, scattered pine trees rise from high banks along the river. Stoic bald eagles stand guard in the branches of a few of the old matriarch trees along the ten mile float. In the bow of the boat is an experienced fly caster throwing precise casts in rythym with their fishing partner fishing in the stern of the boat. Both fly fishers hook and land many satisfying, hard fighting fish that day from 12 to 19 inches. Alert the media: this is not the Big Horn, Yellowstone, Green or Missouri. These fly fishers are within one and a half hours of the Twin Cities of Minneapolis and St.Paul. 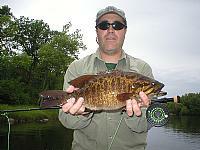 They are fly fishing on the wild Upper St.Croix River for the king of warmwater game fish; Smallmouth Bass. The humble source of the historic St.Croix River is located on a divide that separates the Lake Superior and Great Lakes drainage and the Mississippi river drainage. A lone spring on the edge of a northwoods swamp flows south to form the headwaters of this unique river. Heading north from the same deep woods spruce swamp flows the headwaters of another famous river; the Brule. The south flowing spring flows in to a large pond then in to St.Croix Creek. This small stream flows in to Upper St.Croix Lake and from there the St.Croix begins its historic wilderness journey to the Mississippi and the Gulf of Mexico. The St.Croix is 165 miles long, unpolluted and protected by the National Park Service and the Wild and Scenic River act. The Dakota and Chippewa Indians were the first human inhabitants of the St.Croix Valley. The region was rich in game and fish as well as beaver. The Chippewa took advantage of the plentiful beaver and allied themselves with the first French trappers. With French supplied guns the Chippewa eventually drove the Dakota Sioux on to the plains of southern Minnesota. Daniel Greysolon, Sier du Luth was the first recorded white man to visit the pine rich valley of the St. Croix River. In 1679 this member of lesser French Nobility entered the Great Lakes region. At the strategic Sioux Village of Izaty’s on Mille Lacs Lake he claimed a vast, unknown wilderness empire for Louis XIV, King of France. When Du Luth traveled the watersheds of western Lake Superior the Indians told him of twin streams joined by a carrying place and leading south to the mighty Mississippi. He learned that “eight leagues from the extremity of Lake Superior on the South side “ was a rough, tumbling river flowing north in to the lake which the Sioux called Newissakodekouat. To the Chippewa it became Newissakode (Burnt Wood Point) and Wiskada Sibib (Burnt Pine river). The French named this narrow and turbulent stream the Bois Brule and we know it today as the Brule. In 1683 a voyageur named La Salle reported Du Luth had “ascended the river Nemitsakouat” and after a short portage went down the St.Croix where he “passed forty leagues of rapids”. On this trip the French Explorer built a fur trading post and called it Fort St.Croix. This name was printed on Jean-Baptiste Franquleins map in 1688. After the beaver supplies declined and the European Market for beaver hit bottom the next big industry to come to the St.Croix valley was logging. Unitl the early 19th century the St.Croix valley was a land of great white and red pine. Native Americans, Explorers, Voyageurs and European Trappers, had all traveled the same pristine river that now hosted huge log drives and logging operations. The Weyerhauser Corporation was born in the St.Croix Valley. Weyerhauser was given huge pieces of land, well stocked with the famous old growth pine, in trade for land to develop the railroad by James J Hill. The rough and tough lumber jacks that harvested the virgin stands of extensive old growth forest missed a few pine trees along the river and today they stand guard for future generations to ensure that the wild look of the St.Croix remains intact. Many, small logjams remain today in the river’s flow as reminders of a long gone era of horse drawn sleds hauling huge piles of logs through deep snow until spring thaws halted operations each winter. Once the logging stopped the river began healing itself and the fish populations rebounded. The river supported a strong heritage of sport fishing dating back to the early 1900’s. The first fly fishing operation to do business on the river was owned by Bill Huston a former St.Croix river fly fishing guide himself and a longtime resident of Danbury. Bill and his father operated their fly fishing guide service dating back to the early 1900’s. The camp moved from the Nevers Dam site in the mid thirties to Nelson’s landing in 1936 and then to Round Lake near Danbury. The camp was operated at this location until 1942 when a gentleman by the name of Einar Nelson who guided for the Huston guide service, purchased the business. Einar Nelson’s fishing camp operated for many years was sold again and run by Larry Dahlberg. The camp now operates as the Grantsburg Associates and is managed by Doug (Smiley) Sundquist. Several other fly fishing guides operate on the St.Croix today as well. Sundquist, Tim Holschlag, Tom Andersen, Bob Bickford, Kip Vieth - all are committed to maintaining a fly fishing resource that will remain a high quality destination for the next generation of fly fishers. The St. Croix chooses it’s fish well. The native Smallmouth Bass offer superb fly fishing opportunities. Northern Pike, Muskie and walleye are also worthy fly rod targets found in the St.Croix. Surveys show that the populations of Northern Pike and Muskie fluctuate but we find enough nice pike each year on our floats to make these great fish an interesting bonus catch. Anyone who fishes the St.Croix regularly will hook the odd musky as well. Many encounters with toothy fish like Pike and Musky will end in seconds with a sliced tippet. Each year we land many pike that have the fly seated perfectly in their jaw with the tippet just avoiding their razor sharp teeth. Wire tippet is needed to regularly land these predatory fish. There are many Tributaries of the St.Croix that offer good fly fishing opportunities and have populations of game fish as well. The Snake and the Kettle in Minnesota and the Namekagion and Clam on the Wisconsin side are a few of the best rivers to fish for warmwater species. The Namekagon and Clam are both trout streams in their upper reaches. The Namekagon River is a popular canoe trip for many people looking for a wild float. The famous Kinnikinic and Namekagon Rivers are the most notable trout streams in the watershed. All of these rivers are part of the History of the St.Croix Valley. The St.Croix River is a personal experience for many fly fishers. My father started me on the St. Croix at an early age. I will never forget the first smallmouth that I encountered. After brook trout fishing for a few days my father must have thought young John was ready for a little bigger water so we ventured out on to the St.Croix in a canoe to fish for smallmouth bass. I can vividly remember casting under an overhanging tree and watching my live grasshopper disappear with a big swirl. The ensuing fight was fierce for a youngster. I remember losing that fish but the shock of the raw power in that fish is still with me. Native Brook trout are wonderful and beautiful but are a poor warm up act for the fight of a smallmouth. Over 30 years later I am still captivated by the St. Croix. The Wild and Scenic Rivers Act has preserved the wilderness setting that is part of the wonderful aesthetics of this river. The National Park service has managed this river well over the years. A great full color map is available from the Park service that will help any one plan a trip for one day or to float the river for a week or more. Marked on the map are several access points with many canoe launches as well as riverside campsites. Bald Eagles soar overhead most days. The ubiquitous whitetail deer are regular visitors to the rivers edge. They come to feed on emergent vegetation as well as to get away from the omnipresent mosquitoes. The St.Croix Valley is home to black bears and timber wolves as well. I have encountered both bears and wolves over the years along the river. They are the original residents of this wild river valley. A fly fishing float trip on this river is more than just a fishing trip. There are the magnificent pine, tamarack and spruce trees and also many wild flowers to enjoy. The abundance of bird life is excellent. Each season has it’s own bounty along the St.Croix. “Of all the rivers I have fished, the St. Croix is my favorite” says Tom Andersen, longtime St.Croix Fly fishing guide and Granstburg Wisconsin native. Spring is the time for drumming ruffed grouse, woodcock sky dances and fishing a hatch on the many trout streams that are tributaries of the river. Fly fishing for Northern Pike can be good this time of year as well. The Wisconsin opener for game fish is usually the first weekend in May. Smallmouth bass are spawning this time of year up until mid June and are best left alone at this time of year. Summer is usually quite warm with long days and cool nights. A warm summer evening on the river is magical. Some evenings it seems as if the wild creatures of the river valley are aware of this special time and are putting on a display just for us quiet, stealthy floaters. I have quietly rowed up to several of these indigenous residents as sort of a St.Croix River valley fly fishing trip/Safari. Fall along the river is known for spectacular fall colors, fly fishing for large fish, bird hunting and saying goodbye to a special river for another winter season. The cooling water of fall generates a migration of smallmouth bass to slow deep water. The fish are catchable this time of year but weighted baitfish patterns like a Clouser minnow or shiner imitation are effective. The wide and shallow St.Croix is perfect for fly fishing. Like several guides who work the river, I float my clients on one of several 8 to 10 mile drifts in a Low Profile Hyde Drift boat. There is a classic feel to floating the St.Croix in a drift boat. Any south breeze can be trouble for any drifting fly fly fisher so stay in touch with some sort of weather service. Many fly fishers travel the St. Croix in canoes as well as the inflatable pontoon float boats. The most popular boat for this type of river is a 14 to 16 foot john boat with a small outboard motor to expedite travel in flat water areas and to handle a south wind. The main channel can be very shallow during the dry days of late summer and early fall so the appropriate river craft should be able to drift quietly through inches of water at times. Perfect smallmouth bass habitat on the St.Croix includes long stretches of rocky runs and riffles which in low water can be tough on the hull of any type of river boat. This river valley has attracted all kinds of people in it’s history. This part of Minnestoa was described by the Swedish novelist Fredrika Bremer as “ a glorious country and just the right country for a new Scandnavia” Swedish families began pouring in around the Mid 1850’s. They stayed. Throughout it’s storied history, anlgers have stayed too. A summer day spent casting a surface bug for smallmouth on the St.Croix is one of our great fly fishing treasures. The fishing can be good to great some days. As in all fishing there will be challenging days but this is a river to be enjoyed for all of it’s attributes ,including it’s wild creatures and natural beauties. “The St. Croix is a testament to catch and realease. The Fishing is better now than I can remember.” Says Tom Andersen who has been fishing the river since 1958.